Hi folks. It's Beth Norman here with another Christmas card for you. Welcome to day 13 of the 30 days of Christmas! Are you enjoying all the Christmas cards we're posting? Aren't they awesome? 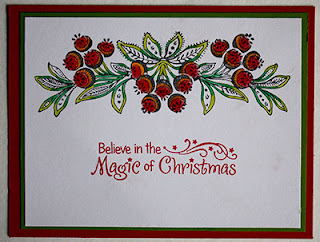 I love to colour and couldn't resist Berries Panel and Magic of Christmas. These two stamps make for a quick card and one that lends itself nicely for mass production. 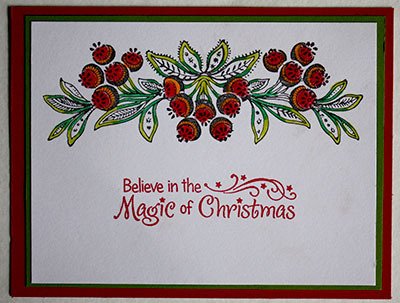 All Christmas stamps are 20% off until October 31st. Use the word Christmas to receive your discount at the checkout. With the Christmas season almost upon us I'm busy making my Christmas cards, knitting and wrapping dishcloths in ribbon with handmade gift tags, and am making thank you cards to give to my sister and daughter. What are you working on?